Jimi Hendrix's second album followed up his groundbreaking debut effort with a solid collection of great tunes and great interactive playing between himself, Noel Redding, Mitch Mitchell, and the recording studio itself. Wisely retaining manager Chas Chandler to produce the album and Eddie Kramer as engineer, Hendrix stretched further musically than on the first album, but even more so as a songwriter. He was still quite capable of coming up with spacy rockers like "You Got Me Floating," "Up from the Skies," and "Little Miss Lover," radio-ready to follow on the commercial heels of "Foxey Lady" and "Purple Haze." But the beautiful, wistful ballads "Little Wing," "Castles Made of Sand," "One Rainy Wish," and the title track set closer show remarkable growth and depth as a tunesmith, harnessing Curtis Mayfield soul guitar to Dylanesque lyrical imagery and Fuzz Face hyperactivity to produce yet another side to his grand psychedelic musical vision. These are tempered with Jimi's most avant-garde tracks yet, "EXP" and the proto-fusion jazz blowout of "If 6 Was 9." The historical importance of this album cannot be overestimated. 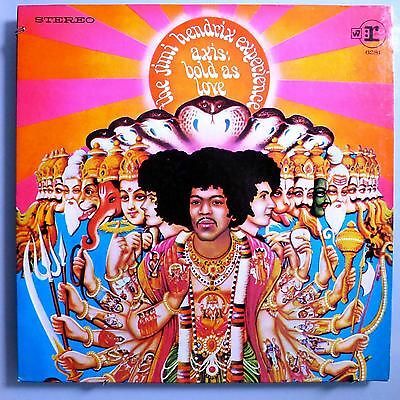 Recorded almost immediately after the Hendrix's first album, "Axis" finds Jimi elaborating on his ideas previously experimented on "Are you experienced", but with much more subtlety and finesse and considerably more pronounced psychedelic "feel" (just check the cover and be instantly experienced!). Some of the most important - and beloved - Hendrix tracks are here. We have a privilege of presenting here a copy from the fast-depleting stock of mega-rare first pressings, on the original 3-color Reprise label. Track listing: EXP - Up from the skies - Spanish Castle Magic - Wait until tomorrow - Ain't no telling - Little wing - If 6 was 9 - You got me floating - Castles made of sand - She's so fine - One rainy wish - Little miss lover - Bold as love. - Cover has JUST A HINT of ring wear (nothing significant); On the scale from 1 to 10 (1 being the least, and 10 being the most severe), we assess the severity of ring wear as 2 (front side) and 1 (back side).